Davidson Farmers Market in North Carolina is in good hands. Abby Wyatt, Davidson market manager, knows the community it serves but aims to address the market’s challenges so that it might establish a more diverse customer base. This is a constant challenge for any market, and Davidson is a market tackling its issues in strides, by assessing from the outside –in. Let’s start by looking from the outside. Predominantly a college town, Davidson has the capability of opening itself up to the surrounding area and diversifying who buys fresh. “A positive/negative of Davidson is that it is a college town and the demographics of the town have shifted quite a bit over the past 10 years from an average upper-middle class town to an extremely affluent town with lots of very well educated people and it can be intimidating at times for ‘outsiders’. As manager, I am really working on diversifying our market,” says Wyatt. Wyatt lives in the next town over, and has made it a goal to bring out-of-towners in for market days. Another Davidson focus: increasing SNAP/EBT usage. “We match up to $20 for our SNAP shoppers and we currently only have 1 consistent family that utilized this benefit. There are communities near the market that are lower income and it has been a challenge to get them to the market,” says Wyatt. The market has 2 big SNAP fundraisers, a local chef pig roast and yoga on the green event. With the resources and means necessary, it’s about pulling in qualifying SNAP customers. Creating inclusion by considering how to cut down on exclusion is a practice we’re sure will serve Davidson well. “Our market has grown so much in size over the past 8 years and we are so proud of that. We have been given so much love and support from the town and our shoppers and we are so grateful,” Wyatt says. 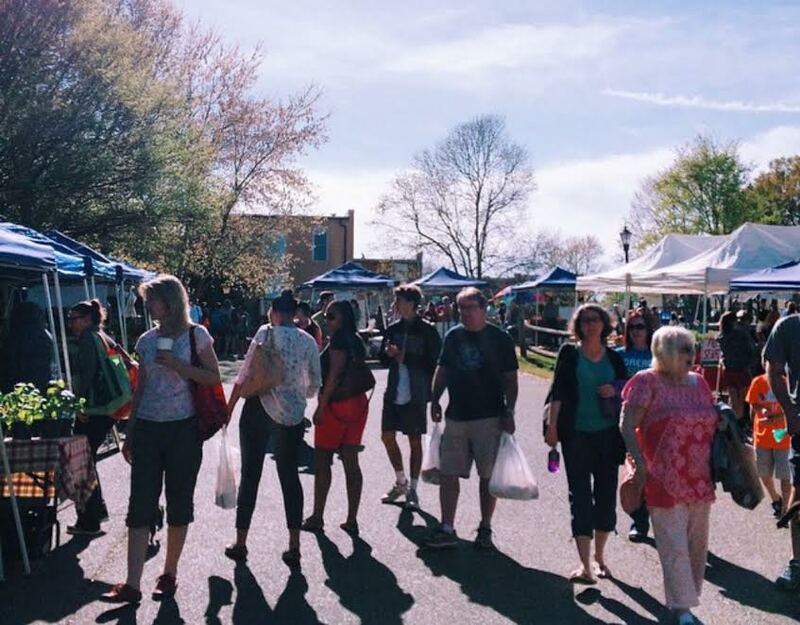 Follow along with Davidson via our Instagram to be a part of their 9th season market days. Abby Wyatt: Our Market has been in operation for 8 years and we are about to begin our 9th year. The market is run by a paid market manager and I, as manager, have an amazing group of volunteers that come out and help on Saturdays with the market. We currently have 36 vendors set to return the market in the spring and we will probably accept 2-4 new vendors next month. Our market is producer only and all vendors must be within 100 miles of the market. The market manager (often with the company of a board member) do site visits for every vendor. The current schedule is every other year for a visit. We use these visits to ensure that the products the list on the application are in fact grown on their farm or made in the their kitchens. It is also a great opportunity for me and the board members to get to know our vendors. AW: Our market is a year round outdoor market that has one location. We run every week from April-Thanksgiving and then run 2x month December-March. We are in a suburban area but the market takes place in the center of the town on it’s Main Street so we do gain foot traffic from people strolling through the town on Saturday mornings. Our market has a great vibe! We do not have permanent structures so we put the tents up every week which give it a fun feel. The layout of our market is unique in that we utilize 2 parking lots and a grass “town center” area so it creates a ‘Z’ shape. In the grass/center area we have a stage for musicians every week and a small playground for kids to play on and parents to sit and chat. We are also situated next to the Davidson Town Hall and Fire Department. 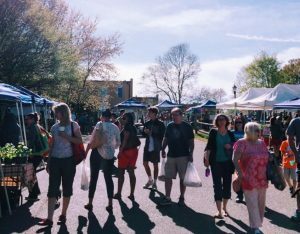 FMC: What are some of the seasonal challenges/adjustments that come with having a year-long, outdoor market? AW: Our market shrinks down a bit for the winter months but we still maintain a decent turnout of around 13-17 vendors, but we also live in the south so the weather usually isn’t bad. We decided this year, after some early snow/ice, to go with the policy of “unless the Governor issues a state of emergency we will be open.” We learned this year that we had some very dedicated shoppers and it was so much fun to see who came out regardless of the weather. The snowy photos on our Instagram bear witness to the fact! AW: We primarily use Facebook, Instagram, and Twitter for advertising but I know there is a percentage of people that choose not to be on social media so it can be a struggle to reach those individuals. We do send out a weekly newsletter and/or important notices via Constant Contact email. In the past I have contacted local newspapers and The Charlotte Observer and they have come and covered events for us. I have also made sure to reach out to other local FB pages/Groups and have asked them to post about bigger events that we have or information I would like to get out and that has been helpful. We do have a small marketing budget that we use for print ads in the spring before the market starts up full time. We do an annual poster that changes each year so we hang those up in the front windows of many businesses on Main Street and surrounding areas and towns. AW: We have lots of events at the market throughout the summer and a couple are used as fundraisers for the market. We hold 2-3 cooking demonstrations a month (April-November) that feature a local chef using market products to create dishes. Samples of the dish are given out and the shoppers/guests are free to interact and ask questions. We do accept SNAP but I wish we had more shoppers using it. That is something we are trying to focus on this year. We do an annual “Pig Pickin’” at the market and 100% of the profits from that event go to our SNAP/EBT matching program. We will match up to $20/week for SNAP shoppers. We raised over $1k last year through our fundraisers. We have a strawberry shortcake sale every May around mother’s day and we have local restaurants bake different biscuits/shortbreads for the strawberries and cream that we also get from our vendors. Last year we held our first annual Kids Day. The kids are placed in teams of 3-5 kids and a local chef is paired with each team as a mentor. This particular market was focused on food, healthy eating, and curiosity. We had “weird, wild, and wonderful” produce from our vendors so the kids could see how food grows. We had a kids yoga session and children from a local music school on stage to play. We will hold this event again this year. We have live music from local bands every week.We have a local land conservancy group, WOW, that has been with us since the start of the market and comes every week and does nature focused crafts and activities with the kids. and this coming year we are restarting the Growing Kids Club that will be at the market 2x month to do food/healthy eating crafts/activities. We are working on setting up a program similar to the POP program. FMC: Could you tell us about the master gardeners program and how it became a part of the market? AW: We partnered up with the Master Gardeners though our county (Mecklenburg) extension office. One of our vendors (Kasper Creek Farms) is a part of the master gardener program in addition to her farm and she is involved and participates with Master Gardener tent when she is not at her own. They usually bring unique flowers for people to see, molds & displays of bugs that can show up in your garden and how to manage them in a green way. They are also there to answer questions that people have about their garden, weed, planting etc. FMC: It seems like you guys are putting an emphasis on engaging kids, from the Growing Kids Club and other activities. What are some of the programs or activities you have introduced? AW: Last year was the first year we did our Kids Day and it was great! Davidson is in the Lake Norman area of North Carolina and Lake Norman is very family oriented so we have tons of families that come out. On our kids day last year we held our first annual Kids Chopped Competition and it was a big success and was so much fun. Based off the Food Network show, the winning team received a 3 month subscription to Raddish Kids that they donated. The kids are placed in teams of 3-5 kids and a local chef is paired with each team as a mentor. This particular market was focused on food, healthy eating, and curiosity. We had “weird, wild, and wonderful” produce from our vendors so the kids could see how food grows. We also had a kids yoga session and children from a local music school on stage to play. We love to have kids at the market and love to see them engaged with the vendors, community, and the food they eat so we will continue to promote and interact with kids programs. FMC: What would you say makes Davidson special? AW: We feel that our market is special because of the community it creates. There are so many things I love about our market and I’m sure most managers feel the same. People come out every week to support the local agriculture community and learn about the food they eat and that is what it all about. We have volunteers of all ages given their time to help us grow and serve our communities and it is such a wonderful experience.